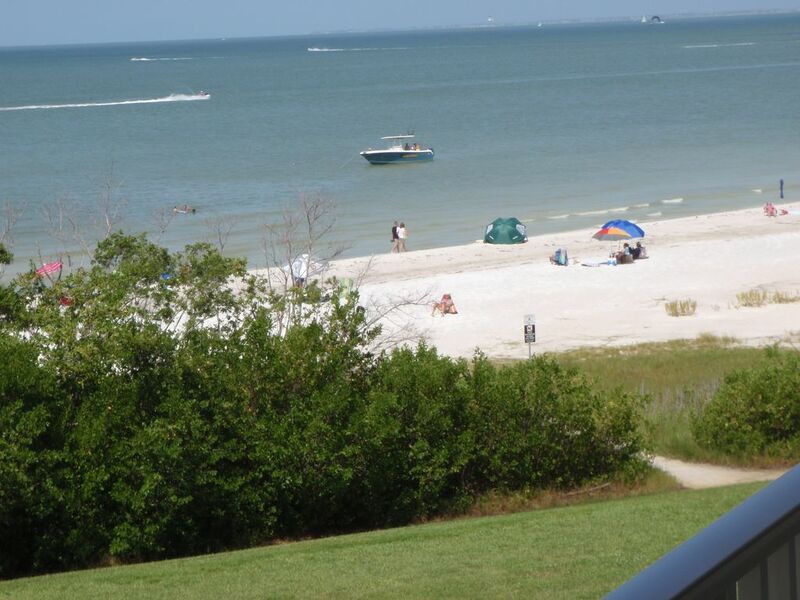 Thank you for looking at our condominium, located directly on Fort Myers Beach, Florida. We are the owners of the condominium – not a management company. We are located on the third floor at tree-top level. You can see more detail at this height without binoculars (Compare the view to sitting on the 50 yard line, near the field, at a football game.). Also, the gentle action of the ocean waves can be heard in the condominium at night with the windows open. If you want a direct Gulf-front close to the action, you need to look no further. Our superior reviews speak for themselves. Below are the highlights of the property stated simply with more detailed information below. This will give you a quick look and won’t take up your time while you search for the perfect vacation condominium. Look no more, you have found it. Direct Gulf-front - all photos of the Gulf views were taken from our condominium. One Bedroom Efficiency (similar to a suite at an upscale hotel). High Definition (1080) Sony 46 inch television. A high definition digital cable box and additional high definition premium channels are provided. This is an upgrade option that you may not find elsewhere. A High Definition (Blu-ray) DVD player and several Blu-ray DVDs. Free Wireless, Secure with WPA2 encryption (the best) Internet (Comcast Broadband) in the Condominium. There is also Wi-Fi in the area under the building with power outlets. Who wants to wash dishes on vacation? You don't have to, we have a Kitchen Aid dishwasher. This is an amenity other condominiums may not have. Who wants to remove ice from ice trays to enjoy a cool drink? You don't have to, we have an automatic ice maker in the refrigerator. This is an amenity other condominiums may not have. Leave your hair dryer at home, you don't need it because a hair dryer is provided. Little things like this mean a lot when you are traveling. Beach Towels provided - another amenity you may not find in other units. Our large pool with several chaise lounges is temperature maintained year-round. Several reviews, all average five (5) star, from previous guests that will let you know what they think about the property. This Gulf-front unit has a view of the gulf that is sure to please! The long side of the balcony faces the Gulf. Views of the Gulf include Sanibel and Captiva Islands and panoramic sunsets, painted with a palette of colors. Enjoy a different show every evening from the lanai/ balcony. Breakfast on the lanai/ balcony will include dolphins swimming close to shore, pelicans “dive bombing” into the Gulf for their breakfast. Ospreys (Sea Eagles) and an occasional Bald Eagle will be seen flying over the Critical Wild Life Area, located out front. Our condominium is equivalent to a Deluxe Suite at a five (5) star hotel that would cost hundreds per night. Take a look at our reviews and if you are still in doubt, compare a room with a Gulf view at the Wyndham Hotel, located about 1/4 mile North of us. The condominium is sparkling clean, bright, and comfortable. Decorated in a Florida Motif (tropical theme), the condominium is well maintained with plenty of arrangements and figurines for your enjoyment. Two ceiling fans, one located in the bedroom, and the other in the kitchen area. This is an upscale unit with amenities such as: 'What's your number? ', A Select Comfort, Sleep Number, King Size Bed to sleep in total comfort. Each side of the bed is adjustable from a soft mattress to an extra firm mattress. A full size bathroom with a shower and tub with plenty of towels and wash cloths are provided. The full-size kitchen includes a large 21 Cubic Foot Refrigerator. A large KitchenAid Dishwasher that is extremely quite. A large microwave, located above the stove, and a stove with a self-cleaning oven. A coffee maker, espresso maker, toaster, and several small appliances are provided. A Sony 46 inch high definition (1080) television and the cable channels include high definition premium channels (you may not find this upgrade in other units), over 100 DVDs, a Blue Ray DVD Player, Free Wireless Internet and Ethernet Broadband (Comcast Cable) connections are available in the condominium. There is a modem and a wireless router located in the condominium with WPA2 security (the best), and a secure password that you will be provided with. A Sony stereo with a CD player is also on the entertainment center. Several games, books, are also in the condominium for your enjoyment. The condominium is professionally cleaned before you arrive and when you depart. There is a vacuum cleaner and other cleaning equipment in the condominium. This area of Southwest Florida is world renown for the beaches. The condominium overlooks a Critical Wildlife Area (CWA), only one of 25 in the State of Florida. In addition, the Audubon Society has designated this CWA as Little Estero Island. Bring your camera for some spectacular photos of wildlife. Why travel to the Caribbean? Everything for a perfect vacation/ holiday is within walking distance. There is no need to rent a car. The bus and trolley schedule is below (click on the link) and you can take the bus from the airport to the bus stop in front of our building. Restaurants and shopping are located across the street. The beach is located about 100 feet out the front door (seven miles of white, sugar sand), four clay, professionally maintained, tennis courts are located on the property, a beach-side heated pool, gas barbeque grilles, ten acres of professionally maintained landscaping, and an 18-hole golf course/ driving range is located across the street. Several restaurants, some with nightly live entertainment, an Italian Delicatessen, post office, Subway, shopping, a bank, CVS, and a full service Marina (boat rentals and fishing supplies – live shrimp to fish with) are all located directly across the street. THE FORT MYERS BEACH CHAMBER OF COMMERCE REPORTS OUR BEACH TO BE THE WORLD'S SAFEST BEACH. The Beach gained the reputation as the World's Safest Beach because of no undertow and shallow water. You can walk the entire 7-mile length of the island along its sandy shores. Warm year round temperatures, Gulf Breezes, seven miles of white sandy beaches, and an unobstructed view of the Gulf from inside the condominium make this a vacation paradise. We accept credit card payments or a personal check (a cashier’s check is not required) on your bank. The condominium is a no smoking unit and no pets. This area of Southwest Florida has abundant wildlife and unspoiled beaches. Our beach-front is habitat for nesting turtles, birds, and other wildlife. The State of Florida has declared the beach area in front, one of 18 Critical Wildlife Areas (CWA), located in the state. The Audubon Society has declared our beach-front as “Little Estero Island”. Cars are not allowed to drive on the beach and all boat traffic must stay offshore at least 500 feet. Enjoy an unspoiled beach that is a private area. The shelling here is world-class. Since the ocean floor of the Gulf is gradually sloping, shells wash ashore with each tidal change. You will find many hand-made shell treasures in our vacation home made by Elise, an avid conchologist (collector of shells). There are a diverse array of mollusks, bivalve, and gastropods, for the avid conchologist. In addition, there are many books to help you identify shells and how to clean and preserve them. Take a walk along our beach and you may be able to find your own “diamond in the rough”. The view of the Gulf from the lanai/porch is spectacular. Abundant wildlife, the gentle wave action of the Gulf can be heard inside the condominium. Full size bathroom with tub and shower. Short walk out the front door to the beach and the Gulf of Mexico. Large pool, shuffle board, tennis, and horseshoes are all provided free. 15,000 BTU Amana A/C and heating. Each bed has two sets of high thread count cotton sheets. Free Wireless High Speed Internet available in the condominium. Living room with a sofa and Lazy Boy recliner. A few seasons, salt and pepper, are provided. Ample dishes, silverware, and eating utensils are provided. Full size kitchen with microwave, dishwasher, toaster, coffee maker, and electric stove. Sony 46 inch 1080 high definition television. Available for rent about 3 miles South on the left. The best seat for the wildlife shows and sunsets are on the Lanai/ balcony while enjoying a meal or your favorite drink. Beach-side, heated and cooled pool.